Dorothy Eugenie Brett was born November 10, 1883. She was the eldest daughter of the second Viscount Esher, Reginald Baliol Brett, who was the Liberal MP for Penryn and Falmouth. Her mother was Eleanor van de Weyer, the daughter of the Belgian ambassador to the court of St. James and a close advisor to Queen Victoria. She was called ‘Doll’ by her family, and like many upper class children of the Victorian era she was raised separately from her parents, receiving little formal education. She went to dancing classes with members of the royal family at Windsor Castle under the supervision of Queen Victoria, but had little contact with other children her own age, apart from her two elder bothers and younger sister sylvia who scandalised the family by becoming the Ranee of Sarawak. This state of being secluded persisted until she was in her early twenties, and was exacerbated by a progressive deafness following an attack of appendicitis. Her attempts to make relationships were met with disapproval by her parents. She was packed off to their summer house in Scotland. But whilst she was there some of her drawings were seen by Sir Ian Hamilton, a friend of the family who persuaded her parents to send her to art school. 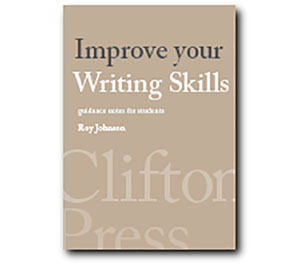 She was accepted into the Slade School on a provisional basis in the autumn of 1910, which turned out to be good timing and a propitious move. She was taught by Henry Tonks, and came into contact with a talented coterie of fellow students who like her were throwing off the shackles of the Victorian age and forging a new form of Bohemianism. She met and befriended Dora Carrington, Mark Gertler, David Bomberg, Stanley Spencer, and Isaac Rosenberg. 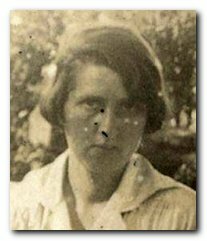 It was a tradition at the school to refer to everyone by their surname, so she became ‘Brett’ to everyone but her family, in the same way that Dora Carrington was addressed simply as ‘Carrington’. The two young women also became pace-setters so far as their personal appearance was concerned. They wore unflattering workmen’s clothes, had their hair cut short in pudding basin styles, and became known as ‘cropheads’. Her father set her up in her own studio – partly to help her develop her artistic career, and partly to move her out of the family home in Mayfair, where servants had begun to complain about the company she kept. She did well at the Slade, completed its four year programme, and in 1914 won first prize for figure painting. Through her friendship with Mark Gertler, she met Augustus John and then Ottoline Morrell. 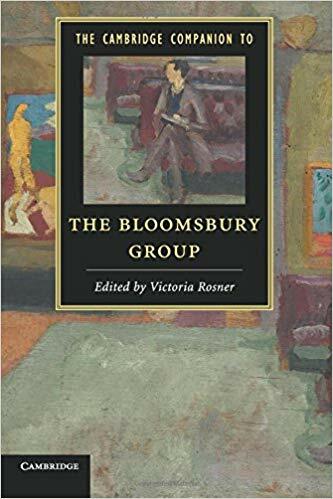 Through this connection she was invited to the famous weekend parties at Garsington Manor in Oxfordshire where she mixed with Leonard and Virginia Woolf, Lytton Strachey, Clive Bell, and Duncan Grant. She also formed two relationship which were to have an important influence on the later part of her life. The first of these was with the equally Bohemian writer Katherine Mansfield, through whom she met John Middleton Murry. All of them moved in to share a flat in Gower Street she was renting from John Maynard Keynes. She was a witness at Mansfield’s marriage to Murray in 1918. This did not prevent Murry from maintaining a flirtatious relationship with her, which later turned into an affair to which she gave way as a ‘forty year old virgin’. It resulted for her in pregnancy and a miscarriage. The other important influence on her life was D.H.Lawrence who she met with his wife Frieda at the Garsington weekends along with the central figures of the Bloomsbury Group. She developed something of a crush on Ottoline which led to a voluminous correspondence but very little else. In 1919 Brett’s parents set her up in a house in Hampstead and gave her an annual allowance in an effort to push her into independence. But it was Lawrence’s restless search for a new way of living which finally drew her into his powerful orbit for good. Lawrence had visited North America and came back to London preaching the virtues of a new artists’ community he was proposing to set up in New Mexico (which he had chosen for its climate because of his tuberculosis). Many of the Bloomsberries expressed an interest in the idea, but in the end only Brett sailed with the Lawrences in the spring of 1924. They settled in Taos, New Mexico as part of the artistic colony established by the wealthy American patroness Mabel Dodge Luhan. She surrounded herself with writers and artists such as Willa Cather, Georgia O’Keeffe. Brett formed a strong bond with Frieda Lawrence and Mabel Dodge Luhan (both strong women) to the extent that they were known as ‘The Three Fates’ in Taos social circles. Brett painted the people and buildings of native America in a style which was simple, with an almost religious sense, producing what are perhaps her best known series of paintings, called ‘The Ceremonials’. There were rivalries and quarrels amongst the artists. Lawrence eventually left and returned to live in Europe. But Brett stayed on, becoming a United States citizen in 1938. She continued to paint and remained in Taos until she died within a few months of her 94th birthday in 1977. Her work is in the permanent collections of the Museum of New Mexico and the Buffalo Museum of Science, in the Smithsonian American Art Museum in Washington DC, in the Millicent Rogers Museum and the Harwood Museum of Art, both in Taos, and in the New Mexico Museum of Art, Santa Fe. In 1955, I (age 13) along with seven adults including my mother and stepfather, sailed the Mediterranean aboard a 10 meter ketch, the Taos Brett. It was named after her by the Swiss boatbuilder Claude Graf, and there were at least 3 successive generations of the boat, all bearing the name Taos Brett. Claude and his then wife “Muff”, apparently visited Brett in the early 50s in Taos and were impressed by her. I don’t know if she ever knew about the boats. Thank you for the biography which is very sensitive. I met Dorothy Brett in Taos in 1965. I was a young Briton travelling the US and was introduced by a friends cousin. She was very interesting and gracious and spent most of a day telling me about herself, Lawrence and others in her artistic world. She gave me a photograph of herself which I cherish. Thanks for your comment. 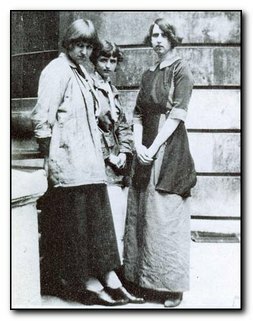 Dorothy Brett is certainly very little known – even amongst Bloomsbury Group enthusiasts. 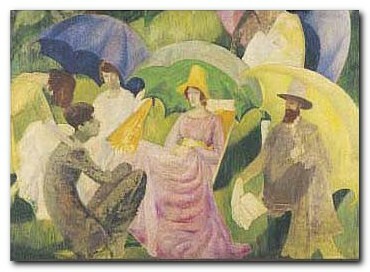 I came across the painting “Umbrellas” in my local (Manchester) City art gallery recently. I think it represents a gathering at Garsington, and I take the central figure to be Ottoline Morrell, and the figure on the far right as Lytton Strachey. She was not buried, but cremated. And her ashes were then scattered on the Red Rocks below Mount Lobo.